I like to get to know my patients on a personal level, and allow them to get to know me, if they like. The bond that develops over time between an oncologist and a patient and his or her family is unique and extremely powerful. “I take pride in spending as much time as necessary with patients, until they feel all issues have been addressed to their satisfaction and are comfortable moving forward,” says Dr. Bruce Gershenhorn. As a Medical Oncologist and the Director of the Lung Cancer Center at Cancer Treatment Centers of America® (CTCA), Chicago, Dr. Gershenhorn works on a dedicated team of cancer experts. Dr. Gershenhorn is board certified in medical oncology and hematology. He earned an osteopathic medical degree from the Philadelphia College of Osteopathic Medicine. He completed an internal medicine residency at Beth Israel Medical Center in New York, New York. In addition, Dr. Gershenhorn completed a fellowship at Montefiore Medical Center in Bronx, New York, where he served as Chief Fellow in the Department of Hematology/Oncology. He was honored with an award for his accomplishments as Chief Fellow. In 2016, Chicago Magazine named him to Chicago’s Top Cancer Doctors list for Medical Oncology. 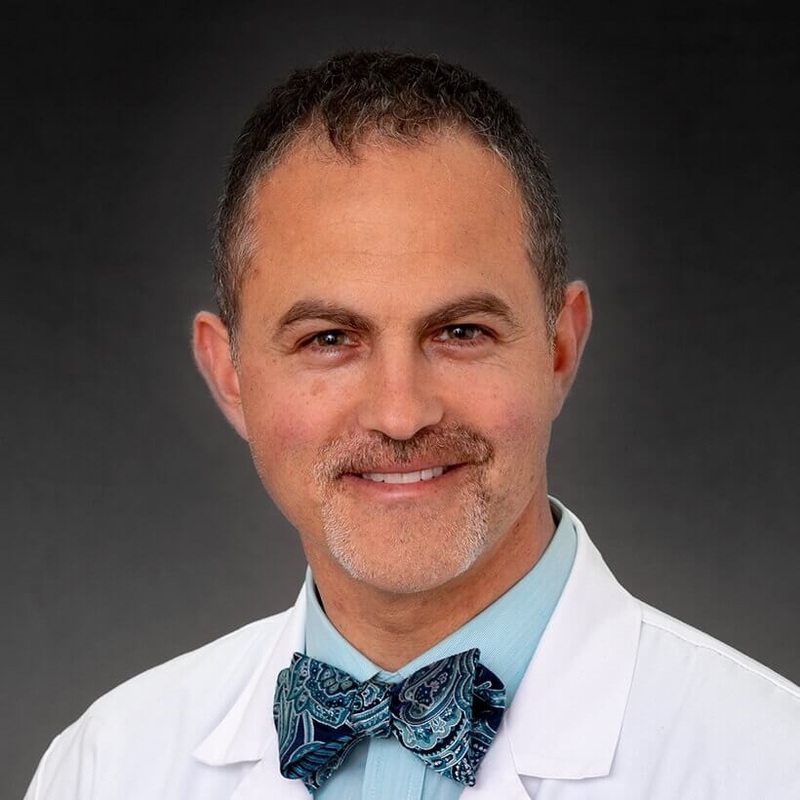 Before pursuing an education in medicine, Dr. Gershenhorn completed a bachelor’s degree in biology at Lehigh University in Bethlehem, Pennsylvania. Just as he feels it’s important to treat patients with great respect, Dr. Gershenhorn also believes it’s essential to encourage patients to learn as much as they can about their disease and treatments. In his spare time, he enjoys gardening, sports and all outdoor activities, especially fishing. The patient ratings and comments on this page are obtained from an external Press Ganey® outpatient survey provided to all eligible CTCA patients within one to two weeks of their treatment occurance. Raw data from the answers to the survey questions about our physicians are calculated by Press Ganey into a one- to five- star rating. In the spirit of transparency, all patient comments are posted as written by the patient, whether they are positive or negative. We only exclude comments if they are deemed to be slanderous or libelous, contain profanity or vulgar language, or do not relate to the patient's experience with the doctor involved. As a result, the comments are the views and opinions of the patients surveyed and are not endorsed by, and may not necessarily reflect the opinion of, CTCA. "Dr Grisnhorn is very good"
"I appreciate Dr Gershenhorn and his staff." "*Dr. Gershenhorn, is an amazing life saver, I can't say enough good about him, very perrsonable, great doctor, and he truly care's about his patient's." "Dr Gershenhorn is very competent. knows the plan immediately for treatment. shows concern for the timing of treatment as we have 3 hr drive as hubby needs to go to work in the afternoon." "I love my Oncologist Dr. Bruce Gersenhorn he explain everything very briefly about results of all test. he always treats all his patients good!" "Dr. gershenhorn has been wonderful even though I'm not always the best patient." "All the doctors are wonderful"
"100% confidence that he is doing the best he can with my situation. God bless him." "We totally trust & love Dr Gershenhorn!" "very caring, awesr And knowledgeable." "I wish I could have taken Dr. Gershenhorn home! I've had bad experiences with the medical oncologists here at home - no compassion whatsoever." "My Oncologists is the best !! He is always looking to make you feel and understand everything that is going to happen and to listen to your concerns needless to say I love him !! my soul is better for it.and my health." "very educated and has my health a priority"
"*Dr. Gershenhorn was able to explain the various options & why he was recommending a particular approach. He used a white board which was helpful." "*Dr. Bruce Gershenhorn is the best he's very friendly, & caring." "Doctor Gershanhorn explained all and as a team we are beating the Dragon"
"Dr. Gurshenhorn is a great Dr. And I have recommended him to many other patients." "Dr Gershenhorn is definitely a Top Doc. Dr G and his team at CTCA saved my life when doctors back home offered no hope." "I adore Dr. Gershenhorn! He listens, is very attentive and appreciates my participation in my care." "Dr. Gerschenhorn is the best and I trust him with my life. I'm truly blessed to have him and his team as I go through this horrible disease. Thank you CTCA for having such an amazing person/doctor on your rolls." "I feel that I am getting the top medical care companion knowledgeable and to let you feel and know that we are in this together ." "*Dr. Bruce Gershenhorn, he is the greatest doctor out of your staff, God bless him." "We do all the time!! Best oncologist on the planet!!" "I have recommended to others"
"Dr. Gershenhorn is fantastic. [...]is also wonderful. They provide excellent care, answer all questions and let the patient and family be part of all the plans. [...] We appreciate Dr. Gershenhorn, [...] and [...] very much." "doctor Gershenhorn and [...] are very top notch. I love them"
"Dr Gershenhorn is the best! He is matter of fact, looks you in the eye, and is very straightforward. I am happy to have him as my Dr."
"He is the best and the team is always on top of my care." "dr gershenhorn & assistant [...] are amazingly kind & very patient when I had questions. I love them both. they are such a blessing! as well the entire team!" "Dr. Gershonhorn is always ready to listen, never rushes us, and seems genuinely interested in how I'm feeling." "I love Dr Gershenhorn. very smart, up front Dr. knows his stuff!" "can't say enough good about Dr Gershenhorn! I'm almost [...] years into Stage [...] lung - and no one could tell I've even been ill! I thank God for my having Dr Gershenhorn as my doctor." "He is a Good doctor he went over my results explained the type of tumor and gave his opinion answered our questions giving me information to make the best decision for me." "Dr Gershenhorn is a wonderful doctor"
"Very good in all areas (put me at ease regarding treatment), gave in detail the processes and forthcoming procedures." "*Dr. Gershenhorn, *[...], and the team are great. All so caring and kind." "So thankful for Dr. Gershenhorn and his team of professionals. They saved my life! Others gave me no hope." "I'm truly blessed that I have Dr. Gershonhorn as my doctor. He's brilliant, kind, thorough, and gives me his time instead of treating me like a number. I feel I'm alive today because of him and the rest of the team." "Dr Gershenhorn has my complete confidence!!!!" "Dr. Gershenhorn is the best!" "We do recommend Dr G all the time!! He is the absolute best oncologist out there!! Hands down!!" "Dr. G and his Nurse [...] are amazing very patient and caring!" "what a great team. love dr. gershenhorn and [...]." "I accepted Dr. Gershenhorn because he was part of the team that treated me when I first came to CTCA in [...]. He is ignorant and I am seeking a new doctor as I write this comment." "We love how kind the staff is." "The VERY best *Doct. G. GREAT." "*Bruce is a great dr. He explained everything well and his staff called within three days of leaving the Cancer Center to let me know my test results." "Dr G is the smartest man I know!" "I do tell future patients that things have changed and are not as good as they were previously. Doctors and others try to get things done. The new time crunch they face now is not doctor or patient friendly. The doctors do the best they can." "although he seems like he really cares for me and my situation... he sometimes spends more time entering info into laptop and talking to me at the same time, than just talking to me.. At the same time if there is any other appointments or anything need right away, he takes care of it for me..."
"My Oncologist is patient, listens, and doesn't make hasty negative decisions leaving the patient hopeless." "I am so thankful to have Dr Gershenhorn! I totally trust & respect him!" "Dr. Getshenhorn is incredible I am totally confident of his recommendations." "he's very good at his job he explains everything going on answer questions in full details"
"I love my doctor! I trust him immensely and wouldn't want anyone else to take care of me. I'm truly blessed to have him!!!" "Dr Gershenhorn is excellent, he's very kind and explains everything going on." "Dr. is accessible and easy to talk to. He appears to have the patient best interest at hand. Would recommend our Oncologist to others." "I have shared Medical Oncologist Bruce Gershenhorn, DO and CTCA to others"
"*Dr.G. is a very caring doctor. He and his team are very professional."